I normally love eating things and writing about things that are not so healthy- that is why I thought I would throw this 80 calorie snack in the mix! It tastes like dessert- and is good for you! Just enough to get me through that mid afternoon slump at work. Fills me up until dinner which won’t be for a couple of hours. I’ll be honest, I feel like a traitor because I have been a dedicated Chobani “eater” for quite some time now and swear by it. However, recently stores like Shop Rite, A&P AND Pathmark have been completely out!! Either they had major sales that I missed or people are catching on to the Greek yogurt trend and seriously stocking up. Either way, by the time I get to the store, I am left to decide between original or honey flavors. No thank you. 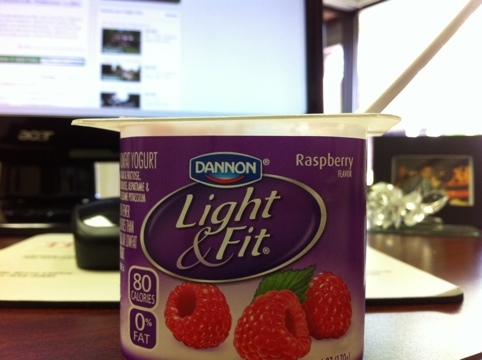 The lack of my favorite yogurt on the shelves led me to this new Dannon yogurt, ok and maybe the purple yogurt cups as I am always drawn to my favorite color, and I have to say… Yum!